Germain Lussier at SlashFilm reports that Fandango now offers "mobile tickets" you can purchase to avoid movie lines and they're everywhere but Arizona! Many airlines have already done away with paper tickets and now one of the largest sellers of movie tickets is finally making the digital leap. 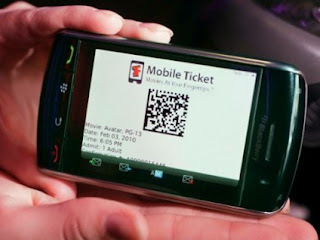 After almost two years of development and smaller test runs, Fandango‘s Mobile Ticket initiative begins its major roll out this weekend at select Regal Cinemas with the release of The Twilight Saga: Breaking Dawn Part 1. People who buy tickets online (not just for Twilight, for any movie) can have a message sent to their phone with a barcode that theaters scan, allowing people to skip lines at ticket booths and kiosks. In other news, apparently Fraggle Rock, the beloved puppet show from the eighties contains a racial epithet. Turns out one of the characters was saying "Gee, Gobo." Gobo being the name of one of the characters. Good thing the puppet didn't say "Nice, Digger". Here's the link love for this week from our friends and neighbors in the blogosphere. Empire reports that they're making a movie out of one of my favorite arcade games: Rampage! Reid Kemper has a great suggestion to get free eBooks. He even lists ten good authors to get into. Pretty cool. Casting for Ender's Game has begun and io9 reports that the star could be Asa Butterfield, the child star of Boy in the Striped Pajamas and Nanny McPhee and the Big Bang. I've seen Striped Pajamas, but can't think what he was like. I'm too depressed by the film to look him up. Arlee Bird has a great story about a mysterious drive through Roswell, New Mexico. I won't spoil it by giving anymore details, but it involves UFOs. Muppet slurs? People are too sensitive. And B. Miller is back? I need to go check her site. Alex, she's still on hiatus. Its an old, but good, post. I liked Fraggle Rock, but it did strike me as racist...especially in the way the diggers always had to supply the food for the fraggles. My favorite muppet was Sam the Eagle. "This is not cultural!" No one gets that much any more. I heard about the casting 4 Ender's Game on the Twitter. Cool. Not in Portland? I wonder if my dinky town will then allow etickets. I think the idea is a great one. Hey, thanks for the plug! That was an unexpected surprise. That mobile ticket thing reminds me of how behind the times I am. I keep seeing those squiggly codes everywhere and now I see how they could be useful. Sigh--someday maybe I'll catch up. The Fraggle Rock story was too funny. That one actually made me laugh. And I did finally pass on the award yesterday. Thanks again for the honor of first recipient! MPax I hope Sam is in the new movie. He's great. I hope your town is in the eticket list! Arlee, your welcome for the plug. It's a great story! Most of those barcode things are useless, but occasionally one is worth looking at.